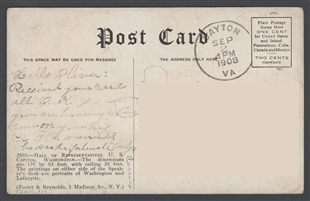 Before 1908, the image and the writing space shared a side on postcards, with only the postage and address on the other. 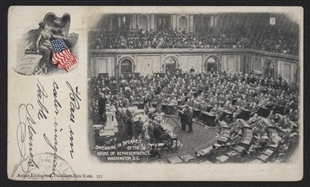 Changes in postal laws in 1908 allowed for “divided back” cards, such as this early example showing the House Chamber. The use of color halftone printing was also on the edge of fashion. 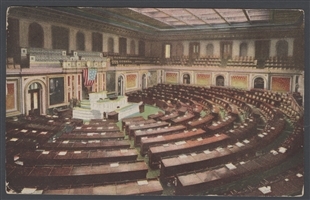 Although applied somewhat clumsily here, it made for an eye-catching image of the Chamber for tourists.